When it came to light that a feature film would be adapted from Goosebumps, R. L. Stine’s immensely popular series of children’s horror novels (1992-1997), it was unclear what form the film adaptation would take: with dozens of original Goosebumps stories to choose from, would the film be an adaptation of just one of them, be an entirely original story, or go with an anthology format? The first two options would likely have gone against the spirit of Goosebumps and would have brought into question the point of calling the film Goosebumps other than to cash in on an existing property. The third option would have been redundant given that the novels were turned into an excellent Canadian/American anthology television series in 1995. In a pleasant surprise, this adaptation directed by Rob Letterman (Monsters Vs. Aliens, Gulliver’s Travels) takes a meta approach. The solution to the problem of how to adapt an anthology series into a single-narrative feature film was, simply, to adapt every single story. The way that this is prevented from being chaotic or confusing beyond measure is by framing it within a fairly generic horror narrative. Surly teenager Zach (Dylan Minnette) is forced to move to the quiet town of Madison, Delaware with his mother (Amy Ryan), and it isn’t long before spooky things start to happen. His boredom and dissatisfaction is soon abated by meeting the cute girl-next-door, Hannah (Odeya Rush), who has a tempestuous relationship with her overbearing father, a fictionalised version of Stine (Jack Black) whose crotchety, reclusive exterior is slowly worn down by Zach, Hannah, and Zach’s new schoolmate, Champ (Ryan Lee). As in reality, the film’s version of Stine is the author of Goosebumps, but the books hold dark and dangerous secrets. Stine’s original manuscripts are vessels, each one housing one of the monsters that he imagined and wrote into being. The only way to keep the monsters from rampaging around the real world is to keep them trapped within the pages of the books. Of course, over the course of the film each monster is set free, resulting in a climax involving so many monsters that it resembles a child-friendly version of the monster massacre from Cabin in the Woods. Goosebumps’ monster mash is of course far less bloody than that of Cabin, but the film manages to be suitably scary within the confines of its PG rating - especially if, like me, you find the idea of a sentient, maniacal ventriloquist dummy named Slappy very unnerving. Both an asset and drawback to the film is that it privileges the character arc of its adult lead, Stine. As it was Stine who created the monsters, it is up to him do most of the leg work in reining them in once they have been set loose. Further, the film’s ultimate showdown is between Stine and the film’s main villain, Slappy the ventriloquist dummy, with whom Stine is doubled. The dummy looks and sounds like Stine, an embodiment of the repressed anger and anarchy that Stine, as a lonely and friendless child, channelled into his monstrous stories. As the film’s prominent adult star it is logical for the filmmakers to want to give Black a lot to do given the draw his name has for adults and children alike. Certainly, Black is excellent as Stine, particularly in his most irritable moments and during an especially entertaining rant alluding to a tense rivalry with Stephen King. I propose that this is Black’s best role since Dewey Finn in School of Rock, a character who is essentially a less intellectual and responsible version of Stine. However, it is unfortunate that centralising Black/Stine comes at the expense of the development of the film’s teen characters. In some of the best children’s horror films (e.g. Coraline, The Hole, ParaNorman), and in the Goosebumps novels and television episodes, adult characters are secondary to the child and teen protagonists. Adults tend to be either ignorant of the child heroes’ plights, unable to assist, absent altogether, or the villains. This unreliability of adult figures privileges the growth of the child characters above all else and puts the responsibility and power in their hands to prevail and to face their fears where adults cannot, and in the process to grow as people. Children in the horror genre are so often portrayed as either demonic beings or helpless victims to be rescued by adults. Horror made specifically for child audiences provides a rare space where the tables can be turned, making adults the helpless or evil ones and putting children in a position of power. In this Goosebumps adaptation, the character who is let down the most by the side-lining of the child/teen characters is Stine’s own daughter, Hannah. The fact that she is the film’s most prominent female character is not a coincidence, and it is the film’s disappointing treatment of Hannah that is the focus of the forthcoming Alternate Take. 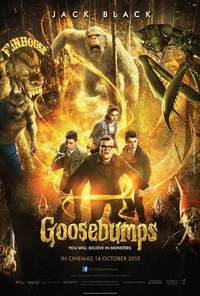 Goosebumps is, on the whole, a highly entertaining family feature that should satisfy adult viewers’ nostalgia for the 1990s novels and television series and function as an excellent gateway into the horror genre for children. However, any possible sequels or other child-friendly horror films that might be produced in light of Goosebumps’ success would do well to remember that something that made Goosebumps special, along with its iconic twist endings, was that the property was originally for and about ordinary kids - not parents hoping to recapture their youth. This review was published on April 04, 2016.